7 minutes to read Molinism removes the metaphysical machinery that underwrites God’s knowledge of free actions (i.e., his knowing what he will cause), but does not replace it with anything. Thus, middle knowledge is a just-so story; an assertion we are supposed to accept “because reasons.” Only…there are no reasons. In virtue of what are the counterfactuals of creaturely freedom true? In other words, what are the grounds of their truth? What makes it true, for instance, that Ali would choose X in some circumstance—given that Ali has not, does not, and will not actually exist in that circumstance? In virtue of what does God know that the counterfactuals of creaturely freedom are true? I do think the grounding objection to the truth of CCFs is a problem for Molinism, but I don’t intend to discuss it in this series because it is not very accessible to lay Christians, requiring a decent grasp of modal logic and a specialized vocabulary. Some arguments, even though they are good, are too technical to warrant looking at outside of philosophy journals. In the past, when I’ve raise the grounding objection, Molinists have pointed me to William Lane Craig’s response, as if it settles the matter. Now, aside from Plantinga’s comment in that article that, It seems to me much clearer that some counterfactuals of freedom are at least possibly true than that the truth of propositions must, in general, be grounded in this way —which is a fine example of the speculative way in which philosophers go about “deciding” the truth of something—this response is simply irrelevant to the theological grounding objection. It doesn’t address the grounding of God’s knowledge of CCFs at all, which is the real issue. So let’s talk about that. The Molinist stipulates that God knows all truths. Therefore, he must know CCFs. QED, problem solved. Now, there is a very sneaky sleight-of-hand going on here which slips under the anti-Molinist radar, because we all agree that God knows all truths. So it’s easy to miss that we have a fundamental difference of opinion here. If you do theology forwards instead of backwards, you discover that God’s knowing all truths is not a bald assertion of Scripture—something true “just because”—but rather a deduction from Scripture, based on God’s relationship to the world. We find that God “upholds the world by the word of his power” (Hebrews 1:3)—that is, he does not merely cause it to exist initially and then let it run on its own like autonomous machinery. Rather, he causes it to exist moment to moment. Because nothing except God has existence in itself, nothing would exist if God did not cause it to exist both initially and continually (John 1:3; Colossians 1:16-17; Revelation 4:11; Genesis 1:1; Ecclesiastes 11:5; Hebrews 1:3; Acts 17:28). But it doesn’t make sense to say that God causes a goat, for example, to exist moment to moment—but then to deny that he causes it to exist in the way it does. If something exists at all, it exists in a certain way or in a certain state or with certain parts and properties. And of course, its way of existing will change moment to moment, with some parts or properties staying the same (the ones that are essential to what it is), and some changing (the ones that are accidental to what it is). So for example, at a moment of time t1 the goat will exist in the way of being a goat (because that is its essential nature, its essence); and also in the way of eating the washing (because this is an accidental property of its being a goat). 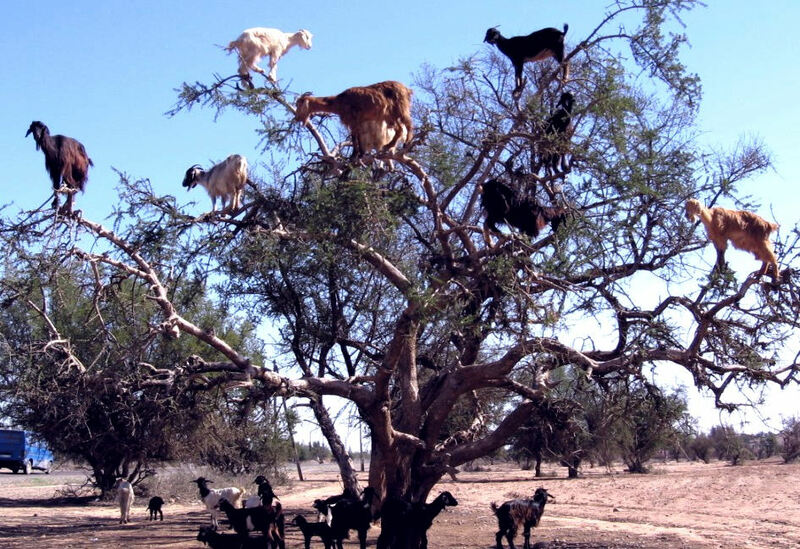 But then at a later moment of time, t2, the goat will still exist in the way of being a goat, but also perhaps in the way of not eating the washing, instead standing in a tree (another accident of being a goat, at least in a tree-filled environment). People, like goats, have essences and accidents, and the choices we make are among those accidents. But the natural implication then is that, if God causes the total existence of our friend Ali moment to moment, then surely he causes both the existence of her essence and her accidents—so he not only causes who she is but also what she does. Put more simply, everything about creation, including human decisions, is ultimately caused by God. And this is certainly the straightforward meaning of many of the passages I mentioned in the previous post. What we find in Scripture is an exhaustive sovereignty wherein God continually keeps everything in existence to the nth degree. This view of God’s causal relationship to the world is important because it is the basis of his knowledge: God knows all truths about creation because he knows what he has chosen to cause in creation. But of course, God does not merely know what he has chosen to do; he also knows what he could choose to do. He knows all the things he could cause in creation, or would cause in creation, given different circumstances. God knows what will or would happen because he knows what he will or would cause to happen. Now notice the Molinist’s sleight of hand: he disagrees that God has this kind of causal relationship with our choices. If he did, his knowledge of CCFs would fall under his natural knowledge rather than his middle knowledge—in which case (i) we could not choose other than we do (violating the principle of alternate possibility), and (ii) our choices would ultimately originate in God (violating the sourcehood constraint). The Molinist intuits that this would make our choices not free, and God would then be the author of sin; hence we need middle knowledge. But does he then commensurately discard the standard doctrine of omniscience? Not at all! He continues to help himself to omniscience, as if God’s knowledge of the world were independent of his relationship to it. And since no one calls him on his little charade, he thinks nothing is the matter, calls this new invention “middle knowledge,” and skips merrily on his way. If you remove the metaphysical machinery that got you omniscience in the first place, you aren’t entitled to keep presuming omniscience—let alone a new category of omniscience called middle knowledge—without giving some other account of it. You aren’t entitled to say God “just knows” counterfactuals of creaturely freedom because he knows all truths, after you have removed the method by which he comes to know all truths in the first place! If you cut the link between God and these kinds of truths, and you fail to replace it with anything that does the same work, you don’t get to keep pretending the link exists. Another way to put this is as follows: knowledge involves more than just true belief. To know something is to believe it for the right reasons. One must be justified in believing it, rather than having a merely coincidentally correct belief. But what justification is there for God to believe that Ali would do X in some circumstance? It cannot be that he “observes” her doing it, since it never actually happens. It cannot be that he knows it because it must be true, since the whole point of CCFs is that Ali is free to choose Y also, and she would hardly be free if it must be true she will choose X. And it cannot be that he knows it because he would cause it, since the Molinist denies that God has that kind of causal relationship with people. So this thorny problem must be pressed against the Molinist: how does God glom onto the truth of CCFs? How are they accessible to him? Molinists—as far as I can tell—have nothing but a just-so story to replace the weighty metaphysical machinery that other Christians rely on for explaining God’s omniscience. But an assertion is no substitute for an argument. Why should anyone not already dogmatically committed to Molinism accept a wink and a nod in place of a plausible contrary explanation? Middle knowledge, on this point, seems to be nothing but an errant fraud; smoke and mirrors concealing nothing. Good distinction, and good post. So, as you said and as I agree, God knows what will or would happen based upon what he knows he will or would cause to happen. Suppose God knows that Ali *would* hang out in the tree with the goats if he were to witness that in person at some specified time. God would know this because he knows that he *would* cause Ali to do such a thing in that specific circumstance. But what about the opposite? That Ali would *refrain* from doing such a thing in that specific circumstance has the opposite truth value. Yet, God would only believe true propositions. And God’s natural knowledge is of necessary truths. So he would only believe one of these (if any). Thus he *would* only cause one of these things to be the case. My question is, if God’s knowledge of CCF’s is grounded in God’s natural knowledge, would God not have the freedom to cause the opposite and thus never possibly know the opposite? In which case, it seems like God’s knowledge of CCF’s falls under his free knowledge, at least for one who believes as you or I do. And God’s natural knowledge is of necessary truths. God’s natural knowledge includes necessary truths, but is not exhausted in them. For example (and a Molinist would agree here), God’s natural knowledge includes his knowledge of all possible worlds that contain no free agents. So all the possible physical configurations of the universe fall under God’s natural knowledge. This being the case, on Calvinism God knows contingently, rather than necessarily, that Ali will hop into the tree with the goats. But I’d go further than this as well: God knows that, given a particular plan he has for Ali that fits into the larger plan he has for history, then she will hop into the tree with the goats. Conversely, he also knows that, given some other plan for Ali and/or for history, she would refrain from getting in the tree. We tend to think of people, I reckon, rather like essences who have no reliance upon God, and for whom only one action is more probable in any given circumstance. But I think this borrows far too heavily and too implausibly from the Molinist’s toolbox. People are much more, I would say, like characters in a novel. God is the novelist. He imagines a character who has some broadly unique characteristics, and then he considers what ends he has for that character, and how she fits into the larger narrative. Based on this, he decides how she will act in any given situation, and develops the narrative to ensure that she acts consistently and believably. But he could have made her quite different, or had her act differently in the same circumstances, depending on his larger plans. As Proverbs 21:1 says, even the king’s heart is like a stream of water in God’s hands—he turns it wherever he likes. My “(if any)” parenthetical statement was my subtle and sloppy way of stating that I had more than merely necessary truths in mind. So my intended reasoning was that, since the CCF I mentioned is certainly not a necessary truth (which was taken as a given and unstated), it would be contingent. But it seemed to me that by selecting one contingent CCF to be true, its opposite would thus be false and therefore make it impossible for God to make the opposite CCF true (in the actual world) given the original CCF’s placement within God’s natural knowledge. So if I may rephrase what I think you’re saying for my own clarity: you’re basically saying that God’s knowledge of any *particular* possible world in his natural knowledge would include God’s decree for that conceivable world which would then limit which CCF’s are believed to be possible by God for *that* particular world. In which case, the CCF in which Ali *refrains* from performing the specified action would be a CCF that is true in a *different* possible world with a different decree or divine narrative. So (contrary to my original thought about your comment) God is not prevented from making it the case that either CCF is true in the actual world and in his free knowledge. Essentially, CCF’s are decree-relative. Is that an appropriate understanding of you at this point? If so, then it seems to answer my original question. I think I was attributing to you an understanding of CCF’s more along the lines of them being true without respect to any one possible world or across all possible worlds and consequently serving more as a limitation on what God can work with. you’re basically saying that God’s knowledge of any *particular* possible world in his natural knowledge would include God’s decree for that conceivable world which would then limit which CCF’s are believed to be possible by God for *that* particular world. Yeah definitely. God’s decree constitutes a critical antecedent condition for the truths in any possible world, at least under Christianity! Yes. I can’t see how you would have a consistent Christian theology where there were truths about the world that God did not decree (going back to posts #1 and #2).